← Celebrating Some of Our Favorite Austen Actors Who Have Birthdays in September!!! In 1768, the year after his admission to the Philadelphia bar, Wilson set up practice at Reading, Pennsylvania. Two years later, he moved westward to the Scotch-Irish settlement of Carlisle and set up a lucrative practice, and the following year he took a bride, Rachel Bird. He specialized in land law and built up a broad clientele. These dealings provided him privileged information regarding land parcels. On borrowed capital, Wilson also began to speculate in land. In some way he managed, too, to lecture on English literature at the College of Philadelphia, which had awarded him an honorary master of arts degree in 1766. In 1774, Wilson attended a provincial meeting, as a representative of Carlisle, and was elected a member of the local Committee of Correspondence. He wrote a pamphlet titled Considerations on the Nature and Extent of the Legislative Authority of the British Parliament. In it, he argued that the Parliament had no authority to pass laws for the colonies. It was published, and later found its way to the Continental Congress, where it was widely read and commented on. He termed the British Parliament’s decision to close the port of Boston “unconstitutional.” Wilson reasoned that if the colonists had no say in Parliament, the move was unconstitutional. Wilson’s words were forward thinking. He was saying that judges should hold legislators accountable. “Judicial review” would become a central tenet of the U. S. Constitution. In 1775 he was elected to the Continental Congress, where he assumed a position with the most radical members-a demand for separation from Britain. James Wilson’s powers of oration, the passion of his delivery and the logic he employed in debate, were commented on favorably by many members of the Congress. He was, however, in a bind. Pennsylvania was divided on the issue of separation, and Wilson refused to vote against the will of his constituents. Many members felt that it was hypocritical to have argued so forcefully and so long for Independence, only to vote against it when the occasion came. Wilson, with the support of three other members who were sympathetic to his position, managed a delay of three weeks, so that he could consult with people back home. When the vote came, he was able to affirm Pennsylvania’s wish for Independence. The next year, Wilson was elected to both the provincial assembly and the Continental Congress, where he sat mainly on military and Indian affairs committees. In 1776, reflecting the wishes of his constituents, he joined the moderates in Congress voting for a 3-week delay in considering Richard Henry Lee’s resolution of June 7 for independence. On the July 1 and 2 ballots on the issue, however, he voted in the affirmative (along with Ben Franklin and John Morton) and signed the Declaration of Independence on August 2. Later, he attacked Pennsylvania’s state constitution that present power to the citizens. Eventually, such wavering made Wilson unpopular and he was not returned to Congress in 1777. Wilson’s strenuous opposition to the republican Pennsylvania constitution of 1776, besides indicating a switch to conservatism on his part, led to his removal from Congress the following year. To avoid the clamor among his frontier constituents, he repaired to Annapolis during the winter of 1777-78 and then took up residence in Philadelphia. Wilson affirmed his newly assumed political stance by closely identifying with the aristocratic and conservative republican groups, multiplying his business interests, and accelerating his land speculation. He also took a position as Advocate General for France in America (1779-83), dealing with commercial and maritime matters, and legally defended Loyalists and their sympathizers. During 1781 Congress appointed Wilson as one of the directors of the Bank of North America, newly founded by his close associate and legal client Robert Morris. In 1782, by which time the conservatives had regained some of their power, the former was reelected to Congress, and he also served in the period 1785-87. Wilson reached the apex of his career in the Constitutional Convention (1787), where his influence was probably second only to that of Madison. Rarely missing a session, he sat on the Committee of Detail and in many other ways applied his excellent knowledge of political theory to convention problems. Only Governor Morris delivered more speeches. That same year, overcoming powerful opposition, Wilson led the drive for ratification in Pennsylvania of the U. S. Constitution, the second state to endorse the instrument. The new commonwealth constitution, drafted in 1789-90 along the lines of the U. S. Constitution, was primarily Wilson’s work. Although James Madison is credited as being the Father of the U. S. Constitution, Wilson did contribute a draft of the document. Many of his ideas became part of the “American conscience,” for example, the power of government emanates from the people and a system of checks and balances ensures that power cannot be abused. For his services in the formation of the federal government, though Wilson expected to be appointed Chief Justice of the Supreme Court, in 1789 President Washington named him as an associate justice. John Jay became the first Chief Justice of the U.S. Supreme Court. He was chosen that same year as the first law professor at the College of Philadelphia. Two years later he began an official digest of the laws of Pennsylvania, a project he never completed, though he carried on for a while after funds ran out. Wilson, who wrote only a few opinions, did not achieve the success on the Supreme Court that his capabilities and experience promised. Indeed, during those years he was the object of much criticism and barely escaped impeachment. For one thing, he attempted to influence the enactment of legislation in Pennsylvania favorable to land speculators. Between 1792 and 1795 he also made huge but unwise land investments in western New York and Pennsylvania, as well as in Georgia. This did not stop him from conceiving a grandiose but ill-fated scheme, involving vast sums of European capital, for the recruitment of European colonists and their settlement in the West. Meantime, in 1793, as a widower with six children, he remarried to Hannah Gray; their one son died in infancy. Four years later, to avoid arrest for debt, the distraught Wilson moved from Philadelphia to Burlington, New Jersey. He owned hundreds of thousands of dollars. He also spent time in North Carolina, but his debts followed him. While still serving on the nation’s highest court, he was arrested and several times placed in debtor’s prison in both New Jersey and North Carolina. In 1798, Wilson was released from a stay in debtor’s prison. 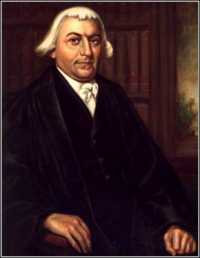 He sought the counsel and protection of fellow justice James Iredell from North Carolina. The years of staying one step ahead of his creditors caused Wilson’s mind to snap. He fell ill. He died a few months, just short of his fifty-sixth birthday. Although first buried at Hayes Plantation near Edenton, North Carolina, his remains were later reinterred in the yard of Christ Church at Philadelphia. This entry was posted in American History, British history, Declaration of Independence, Georgian England, Georgian Era, Great Britain, history and tagged American history, British history, James Wilson, King George III, Parliament, Pennsylvania, signer of the Declaration of Independence. Bookmark the permalink. Most men apprenticed with other lawyers. Jefferson studied for nearly 6 years with George Wythe. Yes, we Yanks say Scotch-Irish. We have a tendency to shorten every word. We have lazy mouths, except we protest. LOL! Harvard was founded in the mid 1639, chartered by the Massachusetts Bay Colony. William and Mary College was founded in 1693. There was also the College of Henricopolis or University of Henrico established by the Virginia Company near Richmond, Virginia. This institution received a royal charter in 1618 and operated a school for several years before being destroyed with the town during the Indian Massacre of 1622.
hear not here you refer to them: for shame Smith! Some 40 odd years ago I happened to befriend a Scot when first arriving in Sydney, and it was he that set me straight on the correct form and/or term for a native of Scotland, and he was most adamant. Sadly Joe drank himself to death some years ago. He was a high rise window cleaner but as the buildings in Sydney got higher and higher so did his alcohol intake, strangely I never saw him drink Scotch,he was a rum character right down to his preferred drink; rum. I shall now go and read that link but I’ll take a bet that it was written by an Englishman or men with the deliberate intention of getting them hot under the collar so that we could have another barney. Then I will have to make up my mind on the written word of someone I don’t know or the spoken words of one I did.